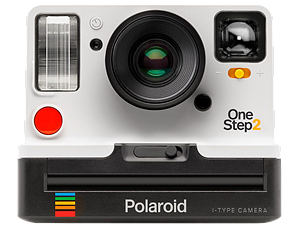 The Polaroid OneStep2 is manufactured by Polaroid Originals, formerly the Impossible Project. It is the only new/current instant camera on the market to use I-type film, which is larger than any of the Instax formats. Simple to operate and light on features, the OneStep2 has some modern conveniences like Micro-USB charging (for its built-in lithium-ion battery). Inspired by the original Polaroid OneStep of 1977, the camera oozes retro appeal. However due to the clunky, somewhat awkward shape of the body, it can be difficult to get your eye to the finder - especially if you're a left-eye shooter. The shutter release is on the front below the flash, which takes some getting use to. Constructed of plastic, the OneStep 2 is fairly light-weight, but feels well-built. Its rechargeable battery is quoted as providing 60 days of charge, which should translate to at least 100 shots (10 film packs). But beware, ours died while ejecting the photo, jamming the camera and effectively ruining the better part of a film pack. There's no real features to speak of outside of a self timer, which is fine by us - having the largest film format is a feature in and of itself. There's also no info LCD, however ten small LEDs on top indicate the number of shots left. In terms of exposure control, the OneStep2 is nearly fully-automatic. You CAN turn off the flash, but must physically hold the no-flash button while pressing the shutter. There's also a plus/minus exposure option that biases exposure by roughly 2/3rds EV. 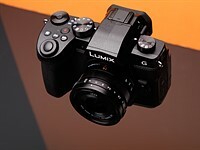 Focus is fixed on this camera, the effective focus range is 0.6 m / 2 ft to infinity, however we found shots taken at infinity tend to have soft focus. Image quality wise, despite the larger format size, we prefer the look and tonality of Instax to I-type. We found a lot of out shots taken with the OneStep2 to be washed-out looking with strange color shifts. Let's face it, no camera in this buying guide screams 'instant camera!' more than the Polaroid Originals OneStep2. If you're seeking something to tap into the instant nostalgia of yesteryear, you can't go wrong with the OneStep2. But the larger format film is pricier than any of the Instax alternatives and doesn't look quite as good.